When David Johnston joins a new company, he transforms it into a first-class safety organization. He has been successful at revamping the safety culture at companies in metal refining, food processing, automobile manufacturing, aerospace and utilities, according to Ray Mullin, specialist, fall and respiratory, at Honeywell in Mississauga, Ont., who has worked closely with Johnston for more than 30 years. Johnston, director of environmental, health and safety at Toronto Hydro, is the winner of the 2013 Safety Leader of the Year award, presented by Canadian Occupational Safety and sponsored by Honeywell. Johnston’s vast experience has served Toronto Hydro well, according to Ave Lethbridge, chief human resources and safety officer. 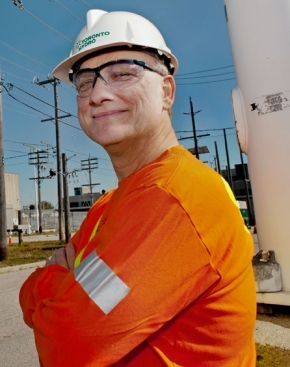 Since Johnston joined Toronto Hydro in 2009, the utility company achieved a 66 per cent reduction in injuries. It has also recently achieved 3.5 million hours without a lost-time injury. In July 2011, Johnston started developing and implementing a health, safety and environmental management system at Toronto Hydro, which has 1,530 employees. The company achieved OHSAS 18001 and ISO 14001 certification in February 2013. Johnston and his team worked hard to develop the system with input from key stakeholders across the organization — which was greatly appreciated, according to Chuck Perry, supervisor, facilities and asset management at Toronto Hydro. As a front-line supervisor, Perry welcomes the new standard as it helps him monitor and plan his daily activities, and the feedback cycle helps his team continually improve. Through striving for the ISO certification, Toronto Hydro saw a huge cultural shift take place across the organization. This was due in part to Johnston’s collaboration with his peers to ensure everyone was on-side, says Lethbridge. “When you’re putting a system in place across the organization, it’s critical to have everyone join you in that initiative and its success is dependent on everyone moving that system forward,” she says. Johnston worked closely with the training and development team to develop a solid risk-based training program at Toronto Hydro. “Training was specifically important (in achieving certification). A lot of testing, a lot of baseline training, a lot of reprogramming of the old training, a lot of procedures had to be written and a lot of employees had to be engaged,” says Lethbridge. For example, one of the highest risks the company faces is motor vehicle incidents, as it operates a fleet of more than 600 trucks. The company bought a driving simulator to complement its classroom training, and all employees who drive a company vehicle are required to complete the training, says Johnston. Driver licence abstracts are reviewed regularly and employees with a poor driving record who drive commercial vehicles undergo a two-day in-cab assessment by a third-party professional. This helps with further coaching purposes and to aid in determining if the employee should be allowed to continue to drive the vehicles, says Johnston. A focus on safety is palpable at all levels of the organization. William Graham, a certified power line person, is an apprentice at Toronto Hydro and says safety is a top priority at the company. Having a strong safety culture is especially important at a utility company because a lot of employees work without direct supervision. They may have a crew leader, but their supervisor is responsible for up to five different crews. “These are self-managed teams and we very much rely on their knowledge of hazards and how to work safely, and we need to make sure that knowledge is kept up to date to ensure they are aware of all these hazards so they do not get injured,” says Johnston. an investigation has gone from more than 60 days to less than 15, with a goal of 24 hours. Now, the company investigates every near miss, and incidents and near misses are being reported more and more by employees. “There’s two things going on here: One is employees know we take these things seriously… and that in turn has encouraged employees to start reporting these near misses which perhaps they never would have reported in the past, because they thought nothing would have been done,” says Johnston. It’s important all managers at Toronto Hydro stay updated on safety issues and concerns within the company. To address this, managers receive a weekly dashboard that explains the “status of safety” throughout the organization, says Johnston. When it comes to measuring performance, all managers and crew leaders are assigned a key performance indicator (KPI) for safety. And safety is the most highly weighted KPI for the senior management team. Leaders are charged with encouraging their employees to come to them with any safety issue that may arise — no matter how big or small. “Being an apprentice, my opinion matters, which was surprising to me when I came here. They actually care what I have to say and they listen to what I have to say and take it into consideration,” says Graham. One message Johnston wants to relay to other safety professionals and managers is that safety is not complicated. While there is no silver bullet to fix safety problems, the solutions do not need to be complicated, he says. “The challenge with making the workplace safe is actually having the diligence and making the effort to make those things happen and it really is about sweating the small things and being very granular in your approach and being very picky about those things,” says Johnston. Every day, the hard working employees of Toronto Hydro motivate Johnston. Whether he’s conducting site inspections or just walking by, the employees he sees working together are inspiring, he says. This comes full circle because employees at Toronto Hydro are motivated and inspired by Johnston. Johnston is a real role model to his subordinates, his peer group and the operational leaders in the organization, says Lethbridge.